It is not unusual for me to go back and tweak a project even after I (thought I had) finished it. 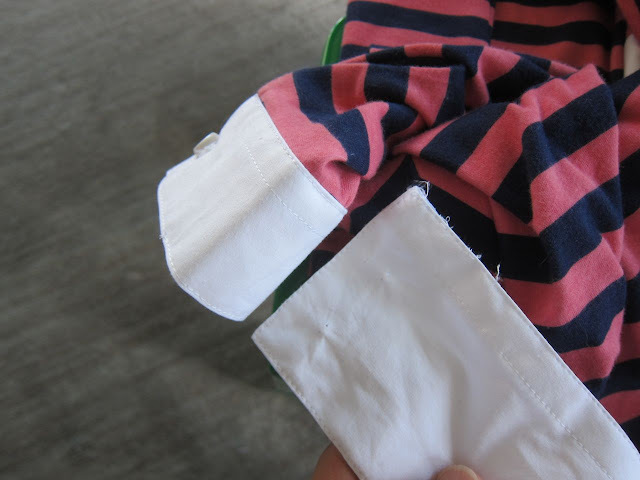 Case in point: my recently completed striped organic cotton rugby shirt. 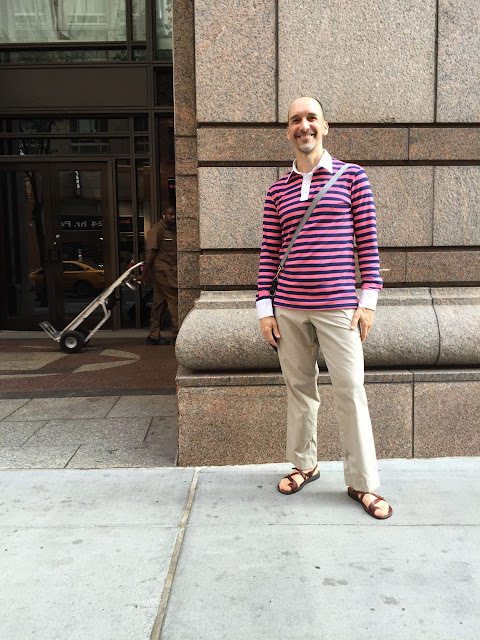 When I looked at the photo of myself up top -- which you've already seen if you follow me on Instagram -- I realized that the white cuffs looked a tad too long (and gave me monkey arms). So this morning, I removed the old cuffs and made new ones that are roughly one inch shorter and have just one button instead of two. I was also able to correct the stripe-matching issue that eagle-eyed MPB reader Lauriana pointed out earlier in the week (and no, there's no visible difference in sleeve length). The result is a cuff I'm totally happy with. 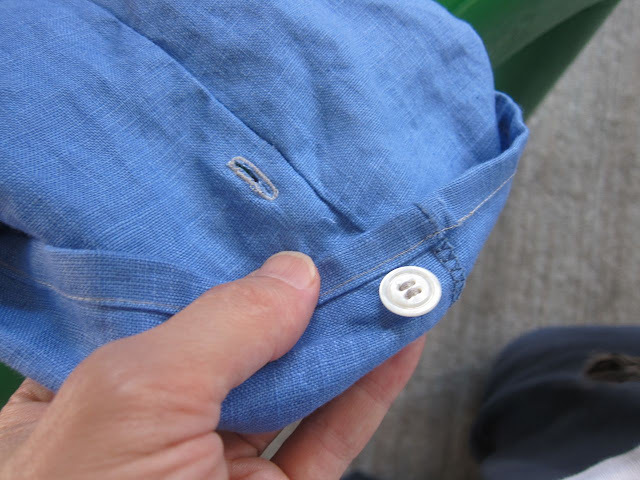 When I make this shirt again I may skip the placket and attach a knit cuff -- much easier. Below you can see the old cuff (on the right) next to the new cuff. 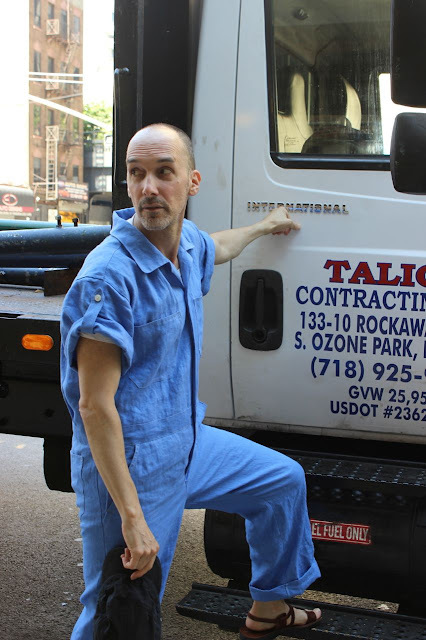 Meanwhile, my blue linen coveralls needed a tweak too. I wanted to keep the rolled-pant-cuff look from my photo shoot without having to resort to pinning them in place. I knew I didn't want permanent cuffs in case I want to wear them longer. 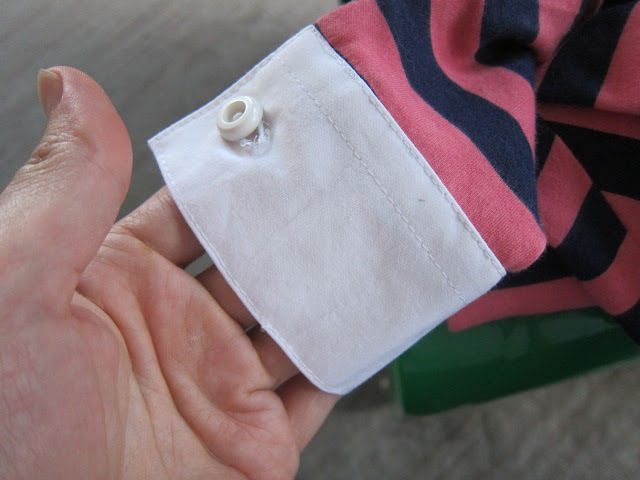 So what I did was to add a small buttonhole on each leg seam, and to place a button on the inside near the hem that, when the pants are rolled up twice, fits neatly into the buttonhole. The cuff still looks loose and casual but I don't have to worry about it rolling down. Finally, a reminder that we're just one week away from MPB Day (Saturday, August 8). 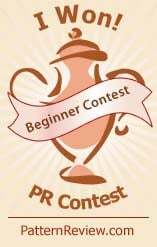 I'm very excited as many past attendees are returning and lots of new people are coming too. If you haven't already RSVP'd and wish to attend, please shoot me an email at peterlappinnyc at gmail dot com. It's always nice to know who's coming, who's missing, etc. It also looks like we will be able to shop at Metro Textiles as I have arranged with Kashi to have him open on Saturday afternoon. Are you a secret project-tweaker? Although I can't attend MPB day, I am looking forward to the recap. I am sure all the attendees will have a great time! I am an alterations sorta person, so tweaks and redos are standard. Pockets get added a year later, I put lacing in the back of a dress that had gravity issues. And yes, those cuffs are more to scale now. Good job fella! I usually save the remnants of the favorite projects, so I can alter them later. And since middle age is widening me, this has been an excellent habit to have developed. 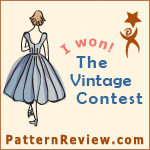 I can still enjoy the drop dead red 70's Dior pattern vintage dress, now with well placed panels (paneling? Pine?). Great cuff idea! And yes, I usually redo stuff that somehow doesn't seem quite right. Otherwise, I'm aware of it and not totally satisfied. To me, it's akin to altering RTW. A knit cuff would be my suggestion. Isn't that pattern from the '70's? I remember back then rib knits were nearly impossible to find, not that it's easy today. The pattern designers probably had that thought of non-availability of knit cuff material and designed a woven cuff instead. I tweak all the time! And the cuffs are so much better. I did notice the stripes not matching on the left shoulder, but didn't mention it.....why not? Dunno. Wish I could come to NYC and join you all. Looking forward to all the photos. I tweak all the time, too. 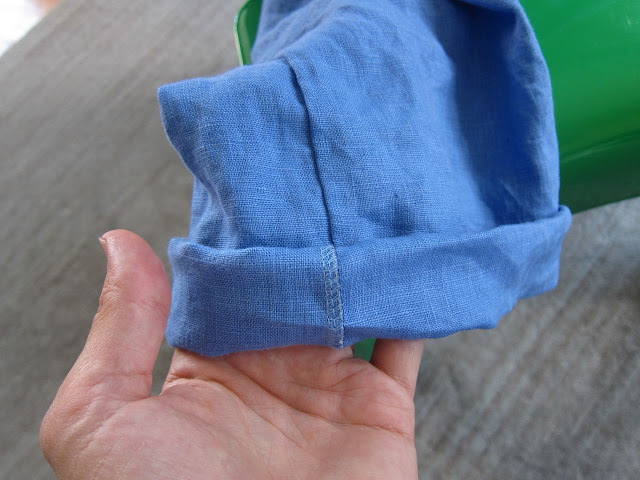 Every time I wash my clothes, I find a mend or tweak. I was inspired by a lady that I read about years ago who remade her clothes as she grew older to make them more to her liking as her life changed. She would totally remake dresses she had been wearing for years. Loved her inspiration!!! 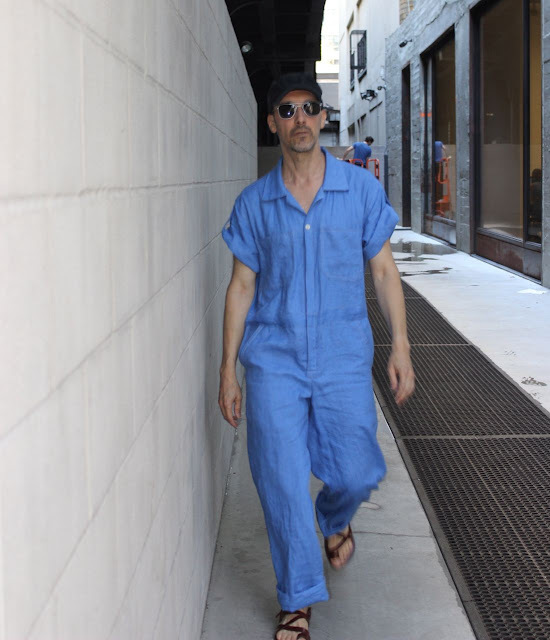 The coveralls are killer. I used to wear an Army/Navy flightsuit around the Village back in the day (way back in the day) and it was the best. As for tweaking projects...almost never. I totally obsess while I work on them, then don't want to get back there unless there's some glaring error. I'm sorry to miss MPB day this year but tell me the date (I plan vacation a year in advance) for 2016! Sorry you won't be there, Michael. It's the second Saturday in August so Saturday, August 13th. 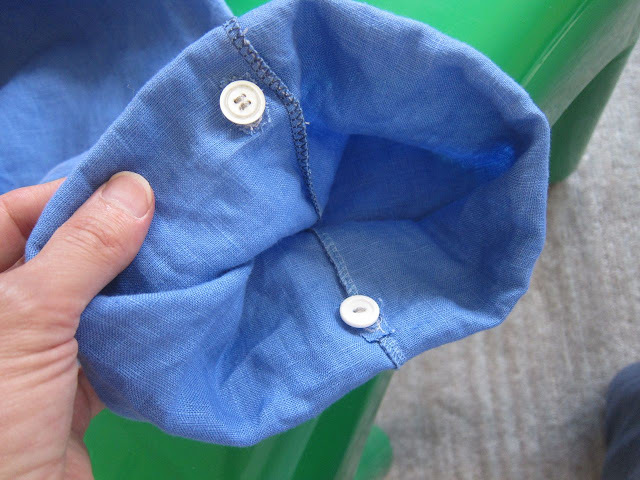 Nice improvement on the shirt cuffs and I love the coverall rolled cuff solution! Looking forward to MPD Day! So glad to hear you'll be joining us, Roberta! I think your tweaks both worked out really well. I hardly ever go back and tweak anything. Even if I should, it usually takes me a long time to get round to actually doing it. And I remember only one of those: A shelf-bust dress with poly boning which had become unwearable (after one day of wear) because the polyester threads in the boning were coming loose from their woven structure at the top and bottom. Their sharp points worked their ways through the fabric and pricked me. A year later, I finally unpicked the bodice lining, removed the bones and applied new ones on which I had secured the ends by melting them over a candle flame. 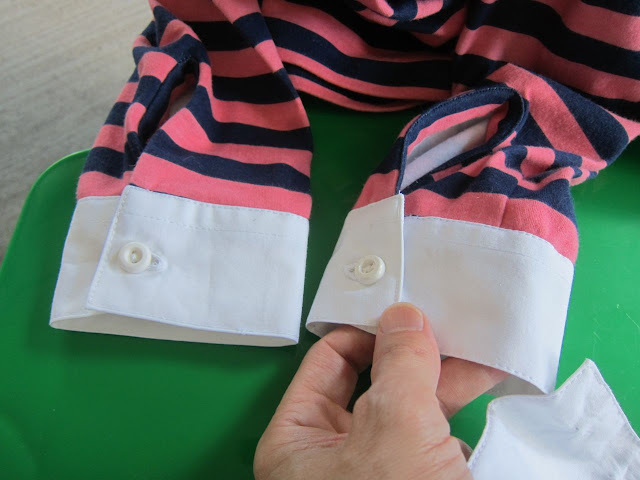 I love the shirt cuffs, and also like looking a man wear it. It makes him seem to be much more stronger and manly.